DW Life > d i v e r s i t y w o m a n . c o m W i n t e r 2 0 1 8 D I V E R S I T Y W O M A N 37 ISTOCKPHOTO "And it's a good way to stay motivated if you can't get to a gym. Some folks will even text a picture of the menu of the res- taurant they're at and ask me or the fitness group for suggestions on what to eat." 6. Ground yourself before you go. at's the advice Johanna Krynytzky usually gives her clients. It's something she herself has done for years. "It can be hard to stay centered and calm when you're out of your routine. But the best thing to do is to take a minute before getting on the plane or going to a business meeting to take stock of your day and ask yourself what you'd like to accomplish," says Krynytzky, who owns a yoga and belly-dancing studio in St. Pe- tersburg, Florida. She tells clients even if they can't partici- pate in a high-intensity workout, it's still important to go for a walk or a run while away. 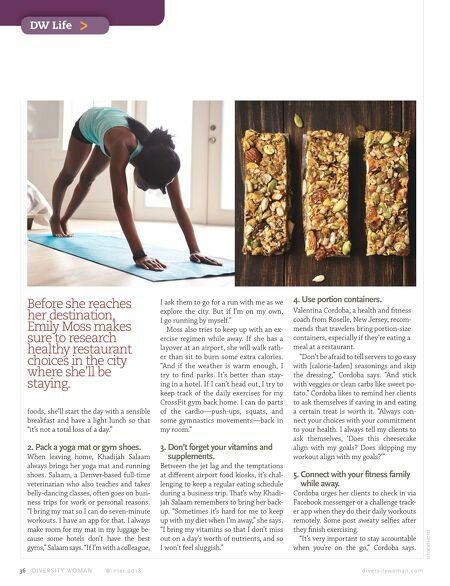 "Set an intention, whether it's to do yoga in your hotel room or to stay away from the dessert bar," adds Krynytzky. 7. Stash healthy snacks. Take along snacks like nuts, seeds, and trail mix and pair them with dried fruit, says Marissa Sweeney, a registered dietitian nu- tritionist (RDN) with clients in New Jersey and Pennsylvania. "Arming yourself with options is im- portant," says Sweeney. "I also would try not to go into the airport hungry. But if you're left with no other choice, go for in- dividual single-serving snacks." When eating at a restaurant, be sure half the dinner plate has vegetables and fill up on those rather than starting first with carbs like rice or pasta, Sweeney says. Her advice for those who have hun- ger pangs in the hotel room: Bring pack- ets of plain oatmeal and healthy energy bars (check the label for calories, carbs, and sodium content). But the best option is to pack your own mix, as that way you can control the ingredients. 8. Forgive yourself. Did you indulge in a bag of potato chips or a handful of chocolate candies? at doesn't have to lead to poor food choices the rest of the day, Marissa Sweeney says. "e moment people slip because they're hungry, they tend to throw the whole day away. Don't have an all-or-nothing men- tality. It's important to look at each meal as its own individual choice." Guilt is the biggest diet saboteur, and Sweeney says it's important to forgive your- self for giving in and eating a high-calorie or high-fat meal. "Everything in life is a bal- ance, including eating healthy. Nothing is ever worth throwing the day away." DW Carmen Cusido has written about immigration, education, and eating disorders, among other topics. She lives in Union City, New Jersey. 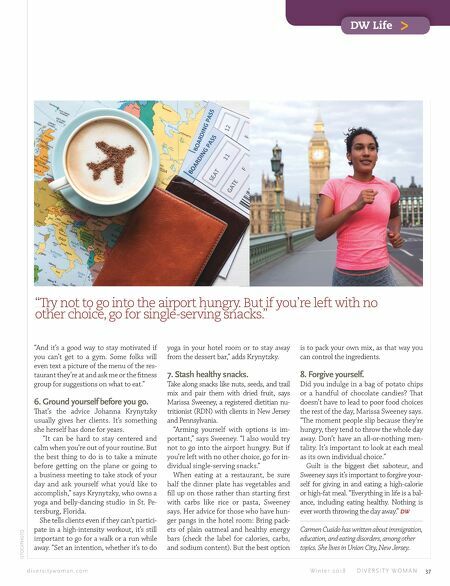 "Try not to go into the airport hungry. But if you're left with no other choice, go for single-serving snacks."